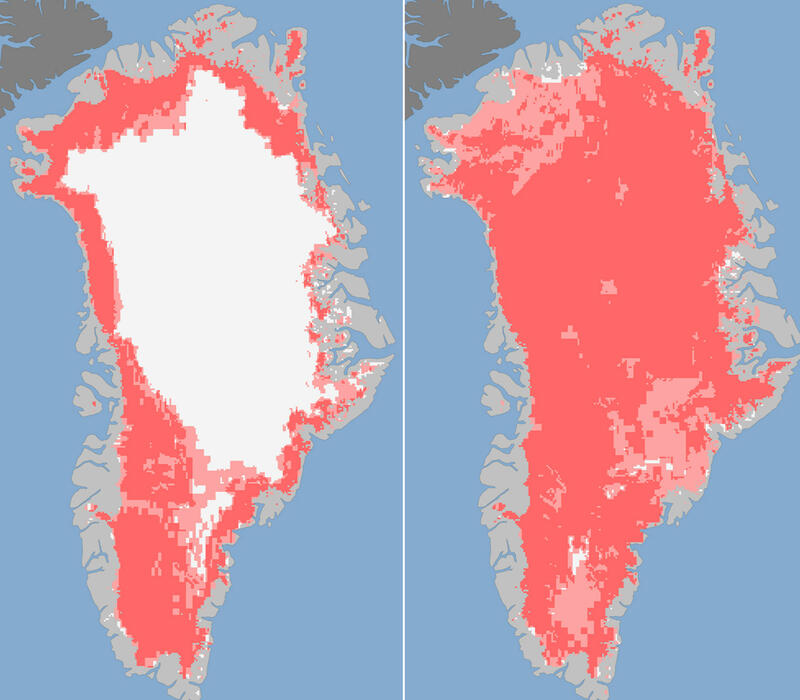 Images released Tuesday show the extent of surface melt on Greenland's ice sheet on July 8 (left) and July 12 (right). Measurements from three satellites showed that on July 8, about 40 percent of the ice sheet had undergone thawing at or near the surface. By July 12, 97 percent of the ice sheet surface had thawed. In a typical year, only about half of the Greenland ice sheet undergoes this kind of melting before it later refreezes. But the rapidity and extent of the July change is what has caught scientists off guard, said Thomas Mote, a professor at the University of Georgia, who helped confirm the data from three satellites. "Several of us were looking at the data with multiple different instruments and we began talking to each other when we realized we were seeing something quite unusual," he says. Scientists note that besides covering a large area, the melting is happening at the top of the ice cap, where temperatures are coldest. They blame a massive heat dome parked over the island that has set up perfect conditions for melting high-altitude snow and ice. Alarming? "I wouldn't use that word," say Mote. "We know from looking at ice cores that melt at the highest levels of elevation in Greenland has occurred in the past — not in our lifetimes, and not since the era of satellites, but it certainly has occurred." The last time it happened was about 150 years ago, in 1889, according to ice core records. But the Greenland melt roughly coincides with a giant chunk of ice described as "twice the size of Manhattan," breaking off the Petermann Glacier in northern Greenland. It's all part of a bad year for the Arctic, helped along by North America's record-breaking heat wave, says Mark Serreze, a senior research scientist at the National Snow and Ice Data Center at the University of Colorado Boulder. The heat has shrunk and thinned ice not just in Greenland but across the region. "The Greenland ice sheet is part of a larger picture," he says. "We've always known that it is the Arctic where we're going to be seeing the effects of climate change first and it is the Arctic where these changes are going to be most pronounced," Serreze says. "The events unfolding over the past 30 years, of which 2012 is really just an exclamation point, are telling us that we've got it figured out."